Christy Gilbert Holstege discovered some of her LGBT constituents had hang-ups about the "B." The desert city of Palm Springs, Calif., about a 90-minute drive east of Los Angeles, is more than just an oasis packed with hotels and restaurants. Amid its impressive collection of mid-century homes and world-class amoeba-shaped swimming pools is a thriving queer community. The city’s Arenas Road boasts a lively strip of LGBT businesses in an era when gay and lesbian bars are disappearing. Enduringly, Dinah Shore Weekend and the White Party, both held in Palm Springs, remain destination events for queer people from around the world. Yet when Christy Gilbert Holstege, a 31-year-old attorney whose practice includes domestic violence and housing law, who happens to be bisexual and married to a man, ran for a seat on the Palm Springs City Council last year, she faced invasive scrutiny about her sexuality from some of the public and media. A graduate of Stanford Law who’s long worked for social justice causes and who serves on the board of Planned Parenthood of the Pacific Southwest, Holstege ran on a platform of alleviating homelessness in her city and handily won a seat on the city council this past November along with Lisa Middleton, a transgender woman. 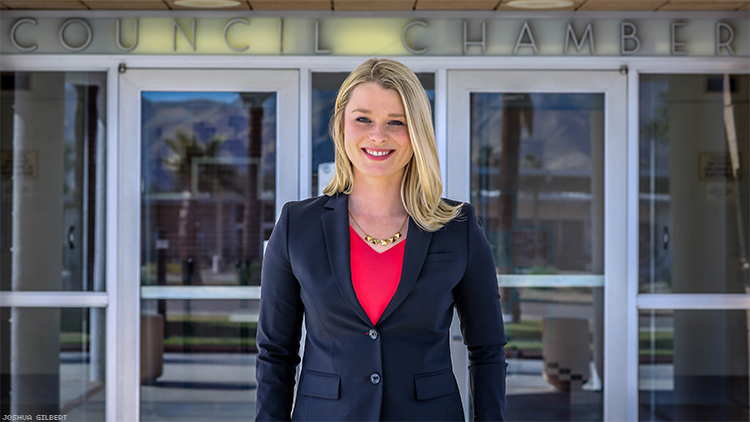 Holstege’s and Middleton’s elections to the Palm Springs City Council made headlines around the country with many national media outlets respectfully identifying the women. “An All LGBT City Council Takes Charge,” was USA Today’s headline, while the New York Daily News headline read “Palm Springs City Council Now Entirely Queer.” But an opinion piece from Frank Bruni that ran in The New York Times about Palm Springs’ all-queer City Council erased Holstege and Middleton in its headline that read “It’s a Gay, Gay, Gay Government,” although the body of the story acknowledged their identities. “You know, Lisa and I, we brought the LBTQ to this and I think that’s the important part of the story is that we have diversity. Because we had a majority gay male council for a while now,” Holstege said, adding that despite encountering biphobia while she ran, the gay men on the city council have been completely supportive of her. Like so many other women who dove into politics this past year, Holstege was spurred to action by Hillary Clinton’s shocking loss to Donald Trump in the 2016 presidential election. On a Planned Parenthood of the Pacific Southwest board call the morning after the election, the 40 or so professional women on the call were distraught, some even sobbing over the unthinkable loss, Holstege recalled. While the 2016 election was the catalyst for Holstege running for office, it wasn’t the first time the thought occurred to her. A Sacramento native who took note of the inequality women and girls faced at a fairly young age, she had long had politics on her mind, and she attended law school with the belief that she’d one day run. Running as an out candidate hadn’t been at the forefront of Holstege’s thinking when she set out, especially considering that in progressive Palm Springs there were other issues, like homelessness and climate change, that seemed more pressing. That is, until they did matter. Holstege sought endorsements where she could, including from Victory Fund, a nonprofit that seeks to elect LGBT candidates. Squarely in the generation dubbed “millennials,” Holstege has embraced expansive progressive ideas about sexuality and gender and chose to identify in conversations where her sexuality came up as part of the LGBTQ community in order to avoid binaries. During the race, despite her record of social justice work, Holstege found herself defending her right to identify as someone within the community even as she was grilled about the veracity of her being bisexual, an exhausting but not uncommon occurrence. But Holstege stood up to the biphobia. The biphobia Holstege faced during her campaign is common enough that advocacy groups like Still Bisexual have formed to empower bisexual people as well as to educate others on how bisexuality works. The kicker though is that Holstege found herself most often explaining her sexuality to members of the queer community. With an eye to the future and an awareness of queer history, Holstege says she engaged in conversations with her Baby Boomer friends who had difficulty understanding that Holstege wanted to focus primarily on the fact that she’s a champion for social justice and progress rather than on the details of her sexual history. Although Holstege faced biphobia and erasure from some people under the LGBTQ umbrella, she's proud of Palm Springs, which she calls a “safe haven” and a “beacon of hope” where many LGBTQ voters have found acceptance. There is much to be gleaned from Holstege’s campaign and win, and even more from her deference for the past and hope for the future.